Travelling across Georgia it is hard not to notice settlements of identical white houses with red roofs that stretch for kilometers. Today, in Georgia there are about four dozens of these new towns where the forcibly displaced populations are resettled. The village of Tserovani that is located not far from Tbilisi is one of the biggest settlements of this type. The residents of the village are the victims of the August 2008 war. Mainly ethnic Georgians from Akhalgori live in Tserovani. Russians, Armenians, Ossetians and individuals from mixed families, who for one reason or another, have been forced to leave their homes live here along with Georgians. Tserovani, similarly to other settlements, was built by the authorities in a short time frame within the next few months after the war of 2008. 2,500 cabin type houses, each with 450 square meters of land, have been built on the overall territory of 80 hectares. Cabins in Tserovani are supplied with electricity and natural gas. Each has two bedrooms, a small living room, a kitchen and a bathroom. From the outside. they look identical; however, many have different interiors. The village is home to three hundred families with different destinies, whose lives were changed in just a few days during the August war. Yet nobody can help answer the most important question that each of these refugees have – when they will be able to return home. But the hope of return is still alive. For example, people know that military activities did not reach Akhalgori and their houses are intact and are waiting for their owners to return. Refugees living in Tserovani are even able to visit their homes from time to time. Last year, 2,000 people have received the so-called “permits”: permission from the South Ossetian side to cross the border in a simplified manner. The center of Tserovani is the little square where the school, the kindergarten, and administrative buildings are located. There is a bus route between Tserovani and Tbilisi. However, last time I visited the village I had mixed fillings. On the one hand, the government took care of the refugees and has provided them with a roof over their heads. On the other hand, they have to survive on a miserable social assistance. So, people are not left without a shelter, but their living standards are below the poverty line. “Thank God, we have decent living conditions and most importantly we have a shelter. There are families that don’t have even that. Can you imagine how they struggle especially in the winter? !”, says refugee Iya Ikaladze. Despite all the economic difficulties, she hopes for a better future. “I don’t know where the hope comes from, but I am anyways hopeful”; she says, “if you think nothing good will happen, you can lose your mind”. Iya Ikladze is twice a refugee – first time in the 1990s, and the second time when the 2008 war broke out. She had two flee with her husband and two kids from the village of Tamarasheni near Tskhinvali. They reached Tbilisi having only one spare pair of clothing and found a temporary refuge there. Today Iya Ikladze lives in Tserovani and works in the local store as a cashier. Those who want to live with dignity find ways to do so: they take up any work and do not lose heart. But there are those who are looking for help from the government and humanitarian organizations. For such people, the only income are the pensions and benefits for internally displaced persons (IDPs) in the amount of 45 lari. In the beginning, Tserovani was a big settlement with standard houses and without any playgrounds and vegetation around. Later urban infrastructure and local business developed in the town. Life in Tserovani, while quiet and monotonous, is not stagnant. Many people have developed gardens and orchards around their houses, and engaged in entrepreneurship. Several factories were built. Today, about 50% of the population of Tserovani is employed. 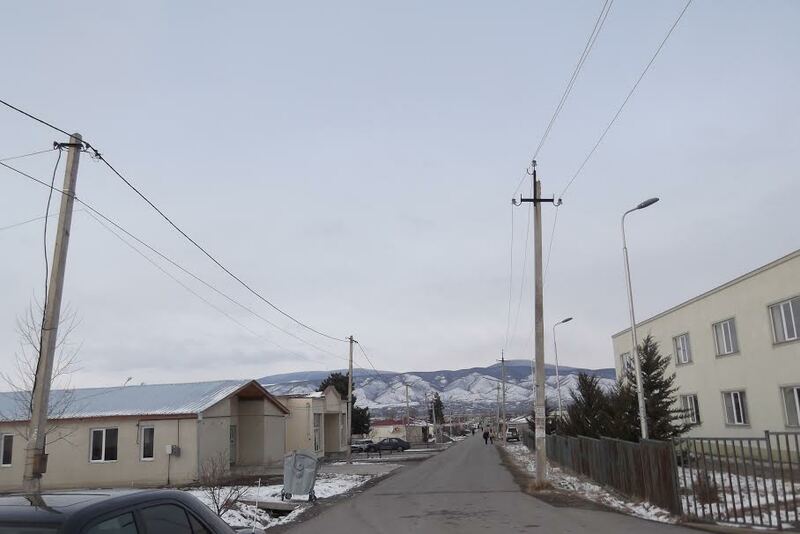 According to the head of Akhalgori municipality Nugzara Tinikashvili, “Yes, in the beginning there was nothing here, but now the town and the infrastructure are developing. The school has 900 students and 80 teachers. This is an accomplished school and the graduates are being admitted to universities. There is a kindergarten with 532 kids attending it. I would like to mention that in 2014 for the first time, the birth rate exceeded the death rate. We have a youth center, a cultural center, two dance companies who successfully participate in different festivals. But there are still many problems. First of all, we should solve the water supply issue. Due to the lack of irrigation water, people are not able to engage in agricultural activity. There is a need for drainage systems: every rainfall creates swamps here. Not all streets are paved. Moreover, the houses were built quickly and not to the highest standard. The walls are thin, already have cracks and it is impossible to heat the houses in winter. People take care of their houses as they can”. Despite the hasty construction, these houses will not serve simply as temporary shelter: most probably many generations will grow up here. It is challenging to talk about the prospects of return of the Georgian population to Akhalgori and a quick resolution of the conflict. Refugees miss their lost homes, and it is especially difficult for the elderly population to adapt to the new life and the new location. “Many will stay here, but if I am told to walk all the way to Akhalgori, I will do that. Young people easily adapt, but the older generation will not adapt to a permanent residence here. We all dream of a time when we can return to our homes”. These are the words of elderly people who asked not to be quoted, “A refugee always has something to fear of – even when everybody around stops fearing”. In the Ossetian version – Leningor (CE Editorial Team). In the Ossetian version – Tskhinval (CE Editorial Team).